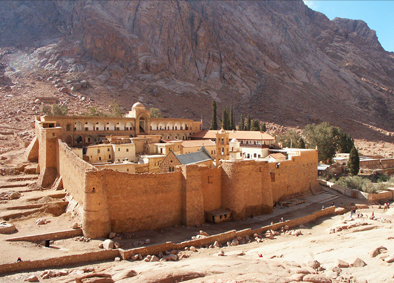 The Holy Mountain of Sinai stands tall in the history of the Church. Considered sacred since the days of Moses, in the times after Christ the sanctity of the Holy Mountain has only become more important to us Orthodox, especially after the establishment there of the famous monastery of St. Catherine the Great Martyr. Many of us who have visited her are daily reminded of that wonderful place by the silver rings that are given out by the monks. Families may remember that a few years ago we had the honor of being visited by Fr. Justin, a monk from this holy monastery. We will soon again be honored, this time by a visit from Fr. Pavlos, a priest-monk from this same monastery. He will be visiting the school at 2:30 p.m. on Wednesday, October 13th, and will be speaking to the older children after prayers, during the last class period. Parents who are interested, warmly invited and encouraged to join our students and staff in coming to see a living example of the ancient monasticism of our Church.